Olympic Torch Tower Cake something of a surprise entry to this month Olympic Calendar Cakes. After making a sponge cake using a different recipe, heavens knows why I have a perfectly good reliable recipe I usually use. The sponge was something of a disappointment and was best used in a trifle. However I did have some leftover, and decided to make a last minute entry into this months Calendar Cakes. I made the torch from sugar paste and using a new mould called Sweet Treats bought from the Telford Sugar Craft Show in May. I slightly remodelled the ice cream to create the flame shape, left to dry then painted with lustre dust. Using a pastry cutter cut out disc shapes of sponge, which were sandwiched together with butter cream and jam. Topped off with suitably patriotic sprinkles of red, white and blue and of course the iconic Olympic Torch. 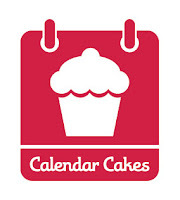 I'm taking part in the Calendar Cakes Challenge hosted by the lovely Laura Loves Cakes and Dolly Bakes. This month's challenge is hosted by Laura and the theme is... The Olympics. 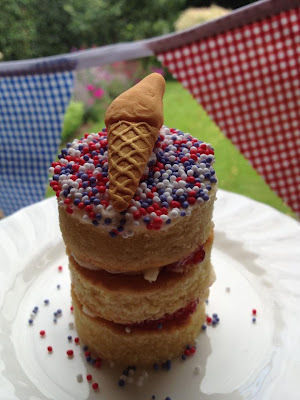 I love your very imaginative Olympic Torch - the cake looks fab. I love this cake!! So creative and perfect for the Olympics!